Retina. Bipolar cells are shown in red. As a part of the retina, bipolar cells exist between photoreceptors (rod cells and cone cells) and ganglion cells. They act, directly or indirectly, to transmit signals from the photoreceptors to the ganglion cells. Bipolar cells are so-named as they have a central body from which two sets of processes arise. They can synapse with either rods or cones (rod/cone mixed input BCs have been found in teleost fish but not mammals), and they also accept synapses from horizontal cells. The bipolar cells then transmit the signals from the photoreceptors or the horizontal cells, and pass it on to the ganglion cells directly or indirectly (via amacrine cells). Unlike most neurons, bipolar cells communicate via graded potentials, rather than action potentials. Bipolar cells receive synaptic input from either rods or cones, or both rods and cones, though they are generally designated rod bipolar or cone bipolar cells. There are roughly 10 distinct forms of cone bipolar cells, however, only one rod bipolar cell, due to the rod receptor arriving later in the evolutionary history than the cone receptor. In the dark, a photoreceptor (rod/cone) cell will release glutamate, which inhibits (hyperpolarizes) the ON bipolar cells and excites (depolarizes) the OFF bipolar cells. In light, however, light strikes the photoreceptor which causes the photoreceptor to be inhibited (hyperpolarized) due to the activation of opsins which activate All trans-Retinal, giving energy to stimulate G-Protein coupled receptors to activate phosphodiesterase (PDE) which cleaves cGMP into 5'-GMP. In photoreceptor cells, there is an abundance of cGMP in dark conditions, keeping cGMP-gated Na channels open and so, activating PDE diminishes the supply of cGMP, reducing the number of open Na channels and thus hyperpolarizing the photoreceptor cell, causing less glutamate to be released. This causes the ON bipolar cell to lose its inhibition and become active (depolarized), while the OFF bipolar cell loses its excitation (becomes hyperpolarized) and becomes silent. Rod bipolar cells do not synapse directly on to ganglion cells. Instead, rod bipolar cells synapse on to a Retina amacrine cell, which in turn excite cone ON bipolar cells (via gap junctions) and inhibit cone OFF bipolar cells (via glycine-mediated inhibitory synapses) thereby overtaking the cone pathway in order to send signals to ganglion cells at scotopic (low) ambient light conditions. OFF bipolar cells synapse in the outer layer of the inner plexiform layer of the retina, and ON bipolar cells terminate in the inner layer of the inner plexiform layer. Bipolar cells effectively transfer information from rods and cones to ganglion cells. The horizontal cells and the amacrine cells complicate matters somewhat. The horizontal cells introduce lateral inhibition to the dendrites and give rise to the center-surround inhibition which is apparent in retinal receptive fields. The amacrine cells also introduce lateral inhibition to the axon terminal, serving various visual functions including efficient signal transduction with high signal-to-noise ratio. The mechanism for producing the center of a bipolar cell's receptive field is well known: direct innervation of the photoreceptor cell above it, either through a metabotropic (ON) or ionotropic (OFF) receptor. However, the mechanism for producing the monochromatic surround of the same receptive field is under investigation. While it is known that an important cell in the process is the horizontal cell, the exact sequence of receptors and molecules is unknown. ^ Kevin S. LaBar; Purves, Dale; Elizabeth M. Brannon; Cabeza, Roberto; Huettel, Scott A. (2007). Principles of Cognitive Neuroscience. Sunderland, Mass: Sinauer Associates Inc. p. 253. ISBN 0-87893-694-7. ^ Bloomfield Stewart A.; Dacheux Ramon F. (2001). "Rod Vision: Pathways and Processing in the Mammalian Retina". Progress in Retinal and Eye Research. 20 (3): 351–384. doi:10.1016/S1350-9462(00)00031-8. ^ Tanaka M, Tachibana M (15 August 2013). "Independent control of reciprocal and lateral inhibition at the axon terminal of retinal bipolar cells". J Physiol. 591 (16): 3833–51. doi:10.1113/jphysiol.2013.253179. PMC 3764632. PMID 23690563. Nicholls, John G.; A. Robert Martin; Bruce G. Wallace; Paul A. Fuchs (2001). From Neuron to Brain. Sunderland, Mass: Sinauer Associates. ISBN 0-87893-439-1. Masland RH (2001). 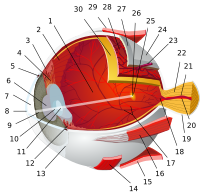 "The fundamental plan of the retina". Nat. Neurosci. 4 (9): 877–86. doi:10.1038/nn0901-877. PMID 11528418. This page was last edited on 15 March 2019, at 17:32 (UTC).